Many people in Uganda do not know where to go if they need medical treatment, and the cost of any investigations and treatment is so high compared to their income that they cannot afford it. Some cannot even afford the transport to get to the hospital. Hence, many conditions / injuries that could be sorted out with minor interventions become chronic and complex, needing major investigations, treatment and/or surgery. People are extremely frightened of any illness or of having an accident, because the financial cost is so high. 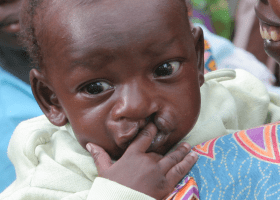 Common conditions that are seen and need plastics and reconstructive surgery are cleft lips and palates, and burns scar contractures. 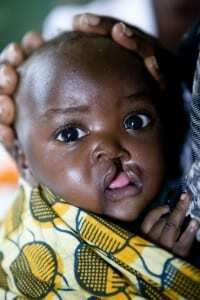 cleft adults can be rejected and do not marry or find work. Unfortunately, before Andrew and Sarah Hodges went to live in Uganda, there were no surgeons there able to do this operation. With the training programme, there are now 4 plastic and reconstructive surgeons in Uganda, and a further 3 in training. There are thousands of adults and children whose lives could still be transformed with this operation. Burn injuries are very common in Uganda, as most people cook on open fires. Many children suffer from terrible burns. The scars heal, and contract, and if they cover a joint, can lead to deformities of the joints. This may cause disability. 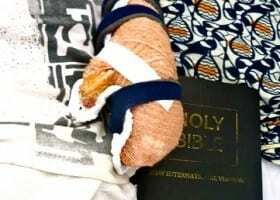 Post-op – thumb and fingers released and hand splinted. This child will need a lot o f physiotherapy to re-gain hand function. Have a look at our ‘patients’ page to see some of the patients who have consented to share their stories and photos. One brilliant initiative that Interface started was to fund a ‘mobiliser’ – this was a nurse from CoRSU hospital who searched for patients in remote communities and villages to let them know they could get help for their cleft lip / palate or burn scars and contractures. This initiative was so successful, that CoRSU are now funding the mobiliser full time to bring patients needing treatment back to the hospital, and Interface helps with the funding of their investigations and treatments if they need it. This is what William (the mobiliser) answered to the question: What stops some people from coming to the hospital for treatment? There are many things that stop people from seeking treatment in hospitals, but the major ones are; traditional beliefs and abject poverty. Some people can barely afford 2 meals a day, so medical intervention for a disability is the last thing on their minds. What have been your best and saddest moments so far? 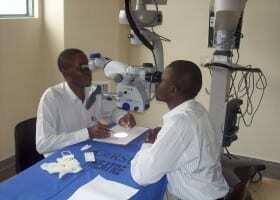 My best moment is every time I see people’s lives changed after getting treatment at CoRSU. For example I saved two babies who were about to be killed because they had clefts. They have now been reintegrated into their communities after surgery. For the full report and other photos, click here.